I wanted to share one of the really special things that we experienced while we were in Galicia this time: The Arde Lucus Festival in Lugo. Now I had been to Lugo once or twice before. As some of you may know, I was born there so this wasn't my first trip. But to see it in this way was an extra special treat. The area of Lugo was originally a Celtic settlement, dedicated to Lugos, the Celtic god, of among other things, light. Depending on your point of view, the area was either a) conquered, or b) pacified by the Romans in 13 BC who built the city which they named Lucus Agusti. By the 3rd century they had surrounded the city with fortified walls mostly to protect the city from the local tribes. The walls still stand and today are described by UNESCO as "the finest surviving example of late Roman military fortifications". In 2000, the walls were declared a UNESCO World Heritage Site. Arde Lucus festival is a celebration of this Roman heritage. If you have ever been in Spain for festivals like Pamplona's San Fermin or Sevilla's Feria de Abril, you will know that they are spectacles of colour and pageantry. And Arde Lucus is no different in that respect. This is no sweaty fraternity toga party. This is the full set of Gladiator. With 600,000 visitors over 3 days, it is a sight to behold. For me one of the highlights was the way the families approached this event, all dressed up together and coordinated. We even saw baby carriages decked out like Roman chariots. They went to such great effort, each putting their own spin on things. It was lovely to see everyone getting into the spirit of things. Of course, there were events and spectacles like a Roman Circus to behold, but for me, the fun part was the people watching. The variety and quality of the costumes was astonishing. 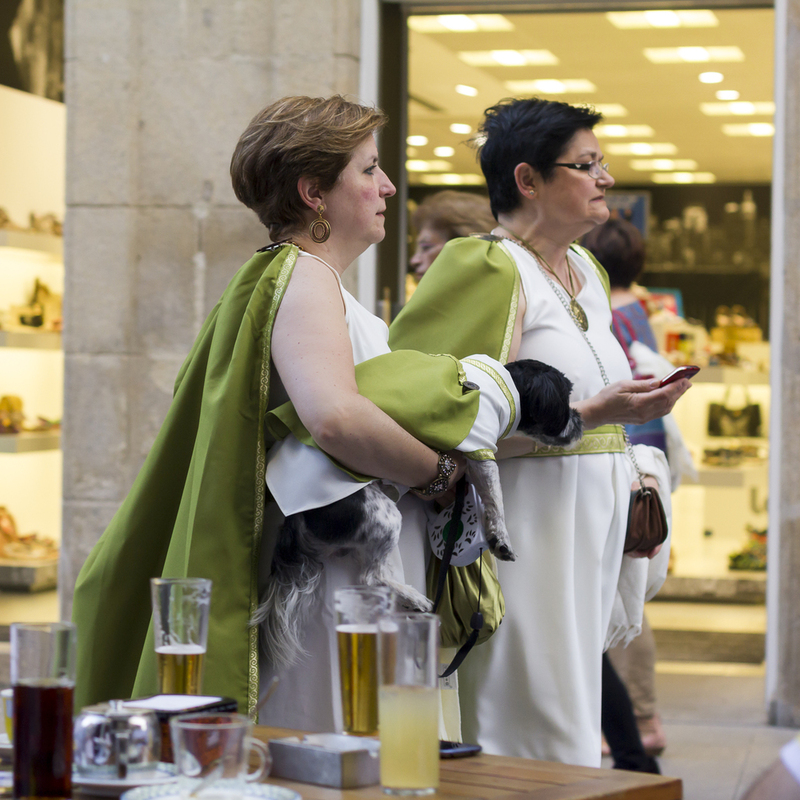 And of course today, Romans and Celts mingle in the streets with little animosity. Of course, we joined in the fun in the bars and restaurants. As we stopped in one restaurant in the narrow street above, we sipped our wine happily, while past the doorway marched legions of Roman soldiers, with their drums and cavalry to boot. For a brief moment I thought of what it must have been like to be a Celt living in a straw covered hut, seeing the Romans marching in and wondering how life would change. But then I took another sip of wine. And everything seemed fine. A truly special display, and if you find yourself in this part of the world around the middle of June, you might want to consider investing in some Gladiator sandals. In 2015, Arde Lucus will take place June 19-21.